Prime British pork (88%), water, onion, sea salt, herbs, dried parsley, black pepper, preservative (sodium metabisulphite) all nicely filled into natural sheep casings. The skins were quite fine just as before and they did cook up OK but they didn't get as snappy as we like, however a pretty good chew all the same. 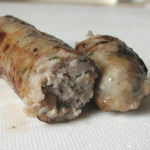 There was this time just a touch of that pale emulsion ooze that we see sometimes from sausages when cooked. This however disappeared but the bottom of the pan needed a bit of work to clean the residue afterwards. Interestingly the teaspoon of oil initially in the pan disappeared to so apart from the drop that would have been covering the 12 chipolatas, the rest must have been absorbed perhaps? Nice to see "pan fry" on the prep instructions. More often on packets/sleeves these days is only the oven cook and grill instructions. 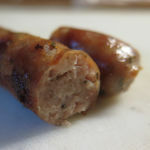 If we had of grilled I think that these little chipolatas my have dried out significantly! 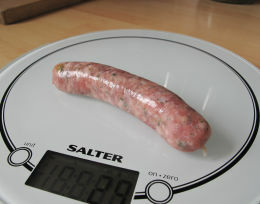 If honest we were expecting a slightly more dense texture given the 88% pork, however the taste with the rosemary and thyme was pretty fair but the seasoning was a little lacking. Eaten cold later, not bad but a little disappointing as any seasoning they did have, was gone unfortunately. 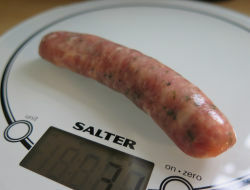 Price-wise two 375g packs for £5 was still the deal, but the large weight loss and shrinkage on what are smallish sausages anyway, could not be ignored unfortunately. Good job only myself and two others were eating as the recommended servings for this pack is 6! 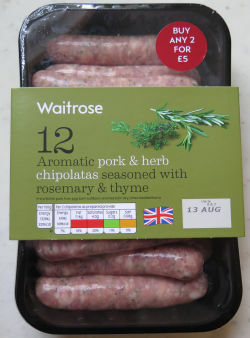 Now come on Waitrose, regardless of the calorie count, two tiny chipolatas per serving cannot surely be enough for an adult! Thus this fact and shrinkage was reflected in the scoring we awarded. Would we buy again? Probably not...however saying that, as a breakfast sausage these would work pretty good when alongside the normal full English ingredients. 100x20mm before cooking, 90x17mm after. 31g before cooking, 20g after. That's a shrinkage of approx 23% & weight loss of approx 36%.